There is a chill stirring in the corridors of corporate power. It’s the data driven company paradigm that is subverting the very foundations of corporate hierarchies and established divisions of labour. Well-established positions within the corporate power structure risk being undermined by new internal alliances, new business processes and shifting revenue streams. Historically, we see that It’s not always the strongest business that survive in times of fast paced technology change – it’s the companies that are best able to incorporate change to their advantage. Today very small companies can challenge even the market leaders using pay-as-you-go IT resources and disruptive business propositions. It’s cold at the top as as shown in an analysis of S&P 500 companies (http://www.cnbc.com/2014/06/04/15-years-to-extinction-sp-500-companies.html) demonstrated; it found that the average lifespan of their top-500 US companies has dropped to 15 years. Very few companies – and certainly not companies with many years of existence, have IT systems and applications that interoperate effortlessly. The drag of legacy is inevitable. The traditional response has been the application program interface (API). By describing a program interface and working towards standardised gateways between applications using brokers like Google APIGEE, Red Hat 3Scale, companies can exchange data between their applications. Actually of course, there are thousands of API definitions. Just finding them and keeping them updated is a serious task. To get into this market, TIBCO acquired Mashery, a UK based software provider of API services in 2015. This company develops and maintains a large library of APIs and provides them as-a-service. So the company has become indispensable for a wide range of companies with large and heterogeneous applications, as well as companies needing to interface with customers’ and partners’ applications. There are clear and present challenges to widespread adoption of API solutions. One is security, where API-security companies like Elastic Beam point out that signature and rules-based security tools do not detect API attacks. The other challenge is user friendliness. If you are going to integrate lines-of-business and enable fishing in your data lake, you need to ensure that the IT gear needed is easy-to-use for everyone. Users outside the IT community have very little patience with slow or complicated systems, let alone systems that require reading a manual! Horizontal business tools require connectivity, the ability to find and sort the relevant data. Then follows the analytics phase and finally identifying what actions to undertake. The London Theatre Direct (LTD) company (www.londontheatredirect.com) is a ticket aggregator selling tickets on-line to London West-End performances. The company has three people in London and 30 back office developers in Prague. It is completely AWS cloud-based and relies on Mashery to keep its APIs running. Building up this business required interfacing with a host of different ticket systems and then creating a unified and easy-to-use selection and booking platform. The early contributors to the aggregator platform soon experienced faster ticket sales here than on their own. So three years into the process, the tide turned and theatres now come to LTD. The company also white labels its platform to other ticket outlets, and has expanded its operations abroad. The Mercedes Formula 1 team (www.mercedesamgf1.com) competes in the heady world of extreme motor sports. The F1 industry epitomises the constant challenge to improve efficiencies, sturdiness and adaptability. Not least when servers and all peripherals are transported around the world 21 times a year. During a race decisions must be based on extracting the right data from the 3.5TB of car performance data that is accumulated on board. Too much data sprawl is just more noise. There is a need to economise when your download window is the 60 seconds’ pit stop for tire change and the car refuelling. To analyse the data and optimise car performance the Mercedes team relies on TIBCO Spotfire and Streambase. While this provides data at rest and streaming data analysis, Mercedes is constantly looking for better automation and machine learning tools. Analysing high volumes of data is also a priority in the Mercedes F1 marketing department with 11 million followers on Facebook. Hitherto they have all been getting the same feeds. TIBCO data scientists are now enrolled into the Mercedes strategy planning to tailor information to the preferences of its followers. The aim is to climb higher on their Facebook wall using tools such as software regression analysis. Messages and icons on users’ walls can also be seen by others. 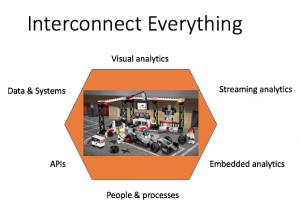 Data driven organisations need to bring together the two symbiotic elements of interconnection using APIs and augmentation using analysis of data at rest and streaming. The guiding principles are: cloud first, ease of use, and industrialisation. The software underpinning this drive must be pleasant and appealing to a wider group of users in the enterprise. Developers need to address the whole range of ‘personas’ who need to interact with the data. Ease of use and robust solution packages must be industry specific and maintained continuously.